You’ll be the daughter of the Mad Hatter and pull anything out of the hat with this Madeline Hatter Ever After High costume for a girl. Ever After High tells us about the lives of the sons and daughters of the most famous fairytale characters. All the characters are intended to follow in the footsteps of their parents in order to keep the stories that they told alive. If not, the stories would disappear and they would too. Ever After High School is divided into two camps, the Rebels and Royals, whereas the latter wish to fulfill their destiny and follow in the footsteps of their parents, the Rebels are striving to change what life has prepared for them. 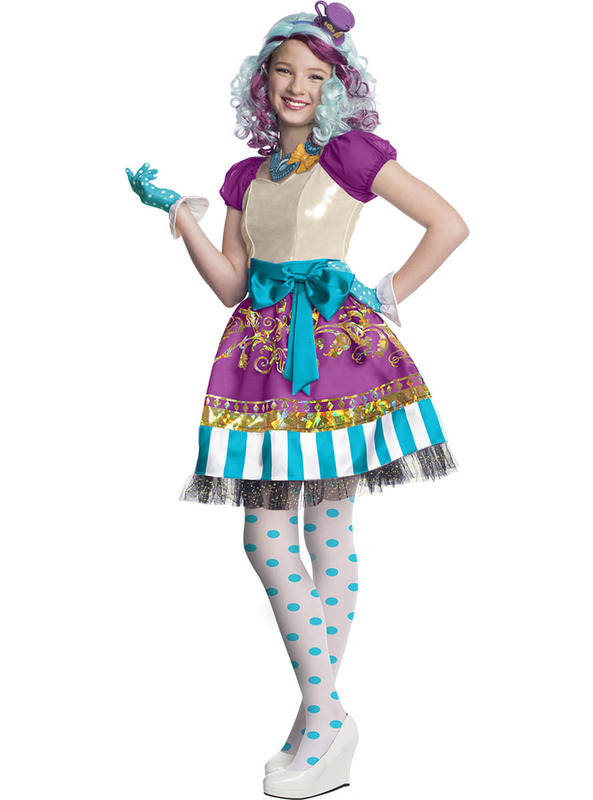 This eccentric Madeline Hatter costume includes a white, purple, blue and mustard dress with different prints, tulle sleeves and bottom of the dress and a blue bow at the waist. Also includes blue gloves with white polka dots and ruffles at the cuff and a necklace in blue and orange. העלה את התמונות שלך ל Instagram עם hashtag #funidelia בא אחריו #funidelia12395. דירוג המוצר: "מדליין האטר אי פעם אחרי תחפושת גבוהה עבור בחורה"